2. Nvidia announced Tegra4, quad-core ARM Cortex-A15 with companion-core, Nvidia's new 72-core GPU, huge new features, the Nvidia Shield gaming console, Nvidia Grid for cloud-streamed high-end gaming. 3. Rockchip RK3188 quad-core ARM Cortex-A9 on 28nm HKMG process node launched for about Exynos4412-level performance in cheap tablets. Rockchip RK3066 dual-core ARM Cortex-A9 also reaching more devices on the market like the Archos Titanium tablet series at $7" 1024x600 $119. 8" 1024x768 $169, 9.7" retina $249 and 10.1" 1280x800 $199, the $169 Archos Gamepad and the Minix HDMI stick. 4. Allwinner A31 quad-core ARM Cortex-A7 in tablets being released: Archos launching Allwinner A31 Powered Platinum Tablet series in 8" $199 and 9.7" Retina $299, Allwinner A31 also shown by Eken and Sungworld. 5. Qualcomm launches Snapdragon 800 series, Qualcomm's next generation ARM Processor records and playsback 4K video. 6. Nufront reaching maturity with their NS115 dual-core ARM cortex-A9 in many thin and light 7" tablets coming out of China. 7. Infotmic launching iMAPx15 dual-core ARM Cortex-A5 processor for low-cost tablets and phones. 8. ARM Powered Set-top-boxes launched like new Marvell Powered Google TV boxes from netgear, Hisense, Asus and TCL and the OMAP4470 Powered Archos TV Connect. 9. E Ink on the backs of Smartphones being launched by Russian Yota Devices, can extend battery life on your smartphone by 10x (talking about weeks of battery life for your smartphone). E Ink was also showing their new awesome higher resolution and front-lit e-reader screens like in the awesome new Kindle Paperwhite (which I've got and that I'll video-review) and the interesting super thin CST-01 E Ink wrist watch. 10. One Laptop Per Child's latest XO-4 Touch ARM Powered laptop release with Neonode IR touch on Pixel Qi screen using Marvell's Armada PXA2128 dual-core with companion core processor. OLPC also launches their XO learning OLPC XO Tablet, optimizing Android for productive use of Tablets in Childrens education worldwide. 13. 4K coming to the market: HiSense introducing $2000 4K 50", $3500 65" 4K and shows up to 110" 4K TVs, Panasonic shows their first printed 4K OLED promising affordable high yield mass manufacturing, Panasonic showing an impressive 20" 4K Tablet, Panasonic talking about 4K camcorder and showing a 4K 46" and 20" LCD TV, Sharp launching 32" 4K Tablet, 60" ICC-4K and showing 13.5" 4K OLED, Samsung's 4K 84" TV for actual release, LG releasing 55", 65" and 84" 4K and StreamTV upscaling and auto-3D. 14. Smartwatches: Italian startup I'm Watch has shipped over 30 thousand, Taiwanese WiMe shows one for $99. 15. Self-driving cars: Velodyne Lidar used by Google, Toyota showing Integrated Safety and Audi talking about their self-driving car. 16. Ubuntu Mobile OS launched, although I prefer their Ubuntu on Android implementation. "Some of the worlds best developers work at Linaro optimizing the future of Linux on ARM. In this 4-hour video series several of them describe software solutions for the upcoming ARM big.LITTLE architecture (ARM Cortex-A15 and ARM Cortex-A7), demonstrate how Linaro Android 4.0.4 runs twice as fast as stock Android 4.0.4 on the TI OMAP4430 Pandaboard, talk about the future of Android, unify the ARM bootloader, combine multiple ARM SoCs into one Linux Kernel for ARM. Canonical works to support ARM Servers, Mark Shuttleworth talks about the opportunity that ARM constitutes for Ubuntu on Laptops and Servers. The CTO of Linaro talks about the next billions of ARM Powered devices that they are working to optimize Linux for." Thanks for your help in getting more people to watch my videos! In a few hours, I start video-blogging 50+ videos here at Computex until June 10th. ARM's press conference at Computex starts just a few hours from now. 1. Boxchip AllWinner A10 and A13 ARM Cortex-A8 with Mali-400 GPU. 24 new videos filmed. Before this trip, I only had 3 Boxchip related videos on my site, Boxchip has now exploded in popularity among Chinese device makers. It offers a beautifully smooth Ice Cream Sandwich experience for a really low cost. This cheap ARM Cortex-A8 SoC with Mali-400 GPU acceleration for Android 4 ICS might be key to make this solution now very popular: $63 no-name from Shenzhen Market, $47 capacitive Boxchip A13, Aipad Wacom, $120 9.7" iPad-like, $79 1024x600 7" IPS from Daza Electronics, FirstView, $85 10.1" Laptops from Sunlike, $80 1024x600 7" and $57 WVGA from Bmorn, Boxchip in Game players by Yinlips, $59 A13 from T Link, 1024x600 compact 7" from Avaid, $49 resistive, Ochang, Yones Toptech, GDB, $60 Apical, $64 Eken, Rocat, Sanxo, 10" Laptop by Kinstone, 7" Laptop by Kinstone, 4upad, Yamay. 2. Rockchip RK3066 Dual-core ARM Cortex-A9 with Quad-core Mali-400 GPU. My Interview with Rockchip about RK3066. The initial benchmarks I've heard about on RK3066 place its performance very high. There are already a range of prototypes with RK3066 inside being shown by a whole range of Rockchip partners. Here are my first RK3066 videos: $128 10.1" 1280x800 by Alldocube, Pipo 10.1" and 9.7". Expect lots new RK3066 devices to be released quickly. The SoC and price difference between this and ARM Cortex-A8 solutions may make this one very popular even for cheap/affordable implementations out of China. 3. MediaTek MT6575 ARM Cortex-A9 with SGX531 GPU. 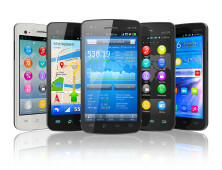 MediaTek looks to dominate the low-cost Android smartphone market out of China. Last year, it was the ARM9 based MT6516 (as in my FG8 phone that I used as my main phone for 9 months until I upgraded to a Galaxy Nexus this February) that only supported 2G Dual-sim, which they then upgraded to the ARM11 based MT6573 with 3G dual-sim about 6 months ago, but now the MT6575 is a single-core ARM Cortex-A9 with full Android 4 Ice Cream Sandwich support. The MT6575 is likely going to have a huge influence on the new higher performance yet still cheap Android phones to come in the next weeks and months out of China. ICS on sub-$150 5" WVGA MT6575 Dolphin A80 phone (2), ICS on 5.2" Hyundai H950 MT6575, $142 Galaxy Nexus clone with MT6575, Zopo ZP100 with MT6575 selling now for $174 street price in Shenzhen (I bought one, I'm waiting for the ICS release within days/weeks), Amoi dual-battery MT6575, sub-$140 5.2" MT6575 by Daza Electronics, Quality Industrial MT6575, $75 3.5" MT6575 by Orient and a bunch of companies showing MT6573 solutions: Yooe/Runtong MT6573 7" Tablet, Long Ten Jie, Sharing, Begin, Dynamax, Vinus, Pusite, Zivi, J8000 and X20i, Zhongyi, Goal, LGTD, Migo, Zhenai waterproof. 4. Rockchip RK2906 ARM Cortex-A8 without HDMI for cheap. As with the Boxchip A13 without HDMI, Rockchip now also releases a new lower cost ARM Cortex-A8 skew without HDMI called the RK2906. The thinking might be that many people in China and worldwide do not have a HDMI or do not need the HDMI output, so they may as well design the SoC without HDMI to save another $2-$5 on the bill of material for the device. I've found it in the $49 Rk2906 7" capacitive tablet by Sawink. Rockchip also launched the RK2908 (also featured in my Rockchip interview video) for cheaper ARM Cortex-A8 Set-top-boxes only. AmLogic announced their AML8726-MX Dual-Core ARM Cortex-A9 design. I think I've been hearing about a Dual-core ARM Cortex-A9 coming from Telechips. But those can not yet be sighted at the fairs as far as I know. A bit can be seen featuring the ST-Ericsson U8500 and low-cost skew U8410, I expect several more devices to be shown soon out of China featuring these. Also offering potentially great value Dual-Core ARM Cortex-A9 for smartphones and connected tablets. I think ST-Ericsson wants to position their Dual-core Cortex-A9 to compete with Single-core Cortex-A9 solutions. Broadcom can be found just a bit. Sprodcom was showing some. I hear rumoring of impending Freescale i.MX6 devices, up to quad-core but I guess possibly also great value lower priced Single and Dual-core devices to come. Renesas announced their MP5232 1.5Ghz Dual-core Cortex-A9 with integrated LTE modem back at Mobile World Congress. But I have not yet found devices featuring that. I wonder if they plan to regain Chinese makers interest with a faster low-cost successor to last year's EV2 533Mhz Dual-core ARM Cortex-A9. Qualcomm seems to have upgraded the MSM7227 with skews that use the new faster ARM Cortex-A5 instead of the previous year's ARM11. I am not sure if I have noticed that on this trip. I get a bit confused as they still call it MSM7227 or MSM7225, they add a T or an A at the end, I forget which is the new Cortex-A5 design. Telechips also has a new Cortex-A5 processor which I first saw in March at CeBIT in the Valueplus Tizzbird HDMI stick, but I am also not sure if I have seen any other devices on this trip using that yet. Being able to borrow this setup for the past 2 months, among many other that I've been able to meet and demonstrate it to, this allowed me to meet Google co-founder Sergey Brin at CES 2012, Sebastian Thrun (Google X, Stanford Artificial Intelligence, Udacity, Inventor of the Google Self-driving Car) and Steve Lee (Manager of Google Maps for Mobile, Latitude and Google X), I was speaking with them for about 5 minutes! Thanks Robert Scoble for taking this photo! I interviewed Robert Scoble about his CES impressions a few minutes earlier. I am really lucky to be one of the first few people in the world to be able experiment with this headmounted computer (they have manufactured less than 250 prototypes thus far). That caught the attention of Google co-founder Sergey Brin who approached me and asked me what it was! I got them to try some of the headmounted voice command software demos in the headset, talk about my $199 Archos 70b Internet Tablet with Honeycomb (and ICS later) which Archos claims to have nearly the third largest worldwide tablet market share with their 2 million Android tablets sold in 2011 (Sergey Brin knows Archos perfectly well it seems, Archos has been making Android tablets for over 2 years but has only gotten fully Google certified since using Honeycomb on their G9 tablet generation released 3 months ago). I wish I had thought to suggest to Sergey Brin and his team when they asked me what was my CES highlight, that I could guide them 20 meters around the corner of the Samsung booth to the Texas Instruments booth that was showing the OMAP5 development kit and the $30 BOM OMAP4 Always Innovating HDMI Stick (similar to the more expensively priced FXI Tech Exynos 4 stick), instead I could only think of telling them that I liked the $75 Eken AllWinner 7" ICS tablet in the Hilton China hall which was so far away from Central Hall they probably didn't spend the time to go there. 2. E Ink provided me with a new demonstration of their latest technology in my E Ink On Every Smart Surface video. Featuring the 300DPI 11.5" E Ink screen, new high-speed stylus on E Ink demos (with the right collaborative text editing and collaborative stylus annotations software, this could be huge! ), on devices like the Eton Rukus, E Ink for digital signage. All your local supermarkets may soon be using E Ink for showing prices in stores. 3. All Camcorder companies seem to wake up to the idea of including low power high performance WiFi streaming and upload into consumer camcorders. See my videos of the Sony Bloggie Live, Toshiba Camileo Air10, Canon HF M52. This is awesome! WiFi in camcorders has been on my wishlist of camcorder features since my post of August 2nd 2008 and my updated camcorder wish-list post of January 31st 2010. Finally the camcorder makers are waking up and differentiating! There still are a bunch of features that I would like from these camcorders. High-quality wireless (multi-Bluetooth) and wired external microphones support. 1080p recording and at the same time live WiFi video streaming, Google+ Hangouts live streaming video upload. Automatic resumable YouTube WiFi upload in between takes. Touch screens to edit Titles, Descriptions, Tags right from the camcorder. WiFi upload must be as fast as using a Laptop. But for sure they are on the right track! I'm looking forward to Panasonic's Sanyo HD3000 level entry into this market, hopefully with all these WiFi features and more! 5. Pixel Qi shows latest status. 10.1" 1280x800 and 7" 800x480 in mass production, a lot of design wins, big brand products to be announced soon. 6. OLPC XO-3 shown for the first time!, OLPC does it again, this time revolutionizing the use of tablets for education, pricing it below $100 for mass orders, building it sturdy, unbreakable, sunlight readable with a 8" Pixel Qi, with a solar charger in the screen cover. 7. ARM Powered Google TV has finally been launched! Featuring solutions shown using the Marvell Armada 1500 platform, Mediatek has an ARM Processor for it, LG showed their new ARM Powered Google TV L9 Processor and platform. 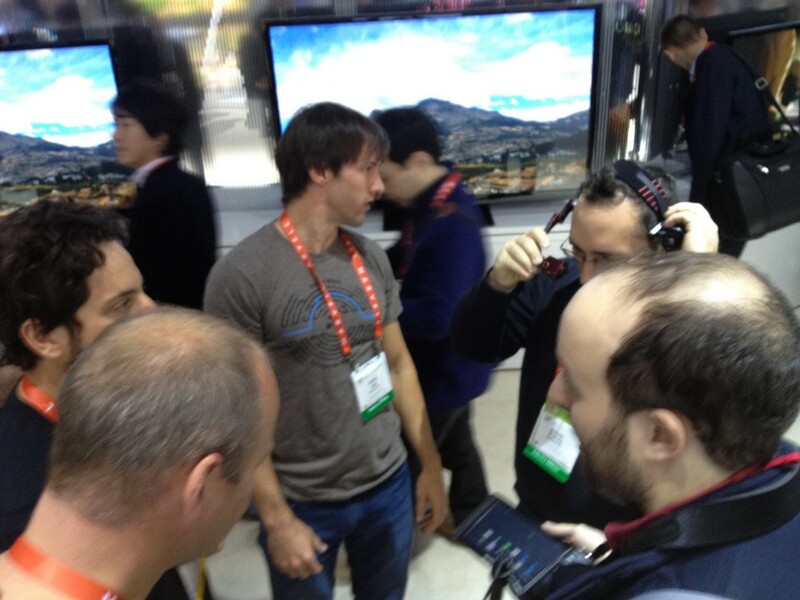 Sony shows their second generation Google TV, now ARM Powered for cheaper/better and more revolutionary and awesome! I expect we'll hear about Samsung, Panasonic, Philips, Sharp, Toshiba all will announce ARM Powered Google TV within months from now. By the half of 2012, most new HDTVs will come with ARM Powered Google TV built-in by default! I also expect as soon as the ARM Powered Google TV software is open sourced that we'll see it run on cheaper ARM Processors that don't do 1080p60fps, overlays, IR blaster and HDMI input. 8. 4K HDTVs are comming! Yeah! 4K 55" HDTVs are always the most awesome demonstrations at trade shows and have been for the past 3-4 years! The arguments by supposed home theater experts that 4K is not usable in living rooms are not true! 4K is fantastic, fenomenal technology to have in the home! Just put your 8 megapixel pictures on an SD card, see those pictures on that 4K 55" HDTV, and be ready to faint, standing up close to the screen the quality is spectacular. Consumers and even professional photographers never get to see the full detail and resolution of their high megapixel photography. Unless you zoom in on pictures, you never get to see more than 2 megapixel of your pictures quality! With a 4K screen in your living room and that you can use as office desktop monitor, the 4K screens are going to be revolutionary. At CES 2012, Sharp claims their 4K-ICC 55" TV is to be mass manufactured and launched at consumer oriented pricing later this year! Samsung showed a totally awesome 70" 4K TV. I have a feeling that Sharp, Toshiba, Samsung and others are just about to launch 4K at hopefully way below $10 thousand, hopefully below $2000 soon! If it's going to be $1999, I recommend everyone save money to get one. As source, all Hollywood movies are already digitized to 4K and that can fit on a regular Blu-ray disc, streamed from YouTube 4K or over 50 4K movies can fit on a 2TB hard drive. 9. Panasonic launches consumer priced HC X900M camcorder with 4K video sensor! But still a 1080p engine for now. The 4K consumer priced camcorders must be very close! My JVC GC-PX10 also has a 4K video sensor! But mine with its Falconbrid 4K processor also is for now only setup to record it to a 1080p (up to 36mbitps) file. 10. Acer shows 10.1" Iconia Tab A700 1920x1200 Tablet. Purely amazing super high resolution tablet displays and Ice Cream Sandwich works amazingly smoothly on it! Retina Tablet resolution has been achieved! Toshiba seems to want to do lots of weirdly sized HD tablets also. 11. Lenovo shows Tablet Dock MSM8960 Qualcomm Krait Tablet convertible. Qualcomm shows MSM8960 for gaming. 12. iRiver Kibot, the small new robots are cool, basic stuff for now. Within 10-15 years we'll be having ARM Powered Robots take care of everything in our homes, washing dishes, take out the trash, cook the food, everything else! 13. 55" OLED screens shown by Samsung and LG. Those are cool for sure! But I expect they are way more expensive to manufacture than 4K LCD screens of the same size today. 14. Freescale launches 2 new skews of their ARM Cortex-A9 i.MX6 processor platform (for E-readers and certain In-Car infotainment segments). 15. New Samsung Galaxy S2 and Galaxy Note clones are invading China! Kente shows some examples. Consider that excellent 4.3" capacitive WVGA 3G-ready Android phones are being sold below $100 in China by now. Check back here on ARMdevices.net during the next few months for a lot of news and coverage on these. Also a cheap new Android phone design by ZTE. 16. Virtualization on Android for Enterprise by VMware, smooth remote desktopping PCoIP protocol on OMAP4 shown by Teradici. 16. LG Spectrum, nice 4.5" 1280x800 IPS-LCD LTE Android phone! LG for sure plans to play an always bigger role in the high-end smartphones market. 17. The Huawei Ascend P1 and P1 S are awesome looking OMAP4460 1.5Ghz 4.3" Super AMOLED Plus 6.65mm thinnest Smartphone in the world. I think Huawei plans to be a huge player in the worldwide smartphones market. Look for this and much more awesome Huawei Android Smartphones coming out. Their main advantage may be their aggresively competitive pricing. If this phone is sold for $299 unlocked, who wouldn't buy it? 18. I did my first live Google+ Hangouts On Air from CES, but because of the interference I couldn't reliably do it at the CES show floor with my headmounted augmented video-blogging system. But I did it every morning on my way between my hotels and the CES showfloor in my series of CES 2012 Monorail Hangouts: 1, 2, 3. I hope to soon do much more impressive things with the Google+ Hangouts On Air features! Expect quality live and on-demand Hangout entertainment from my website at the level of the Hangouts with Barack Obama and Desmond Tutu! Toshiba shows awesome 55" Quad-HD 4K2K screens, I want them to sell it below $1999 now! Galaxy Tab 7.7 shown with large Super AMOLED screen, has yet to be released, my guess the screen is too hard/expensive to manufacture for now and they may redesign to fit jacket pockets. Sharp, Toshiba and Sony launch 4K2K Quad-HD TVs and Projectors, mass produce them and sell them below $2000 now, thank you! Android 4.0 Ice Cream Sandwich source code is released, soon smoothly working on every ARM Processor, OMAP4430, ST-Ericsson A9500, Tegra3, Rockchip, ZiiLAbs ZMS-20 more coming.. Thanks for watching my videos of 2011, Happy New Year! 1. I was on Twit!, I was interviewed by Leo Laporte and Sarah Lane featuring the ARM Powered devices that I use for augmented video-blogging. 2. Techmeme.com CEO Gabe Rivera interview, he runs one of the most influential tech news aggregators, I asked him if he thinks that his algorithms and editors choose too many pro-Apple stories or not. 3. Google social media Analytics interview, Google launched the beta of a tool to measure the value of social media. 4. Yves Behar interview, he's probably one of the top consumer electronics designers in the world, he designed the OLPC laptop and upcoming OLPC tablet. 5. Google Display Advertising interview, an interview with Google's Thomas Serval, Media and Platforms Director for SEEMEA. 6. MG Siegler interview, I only had 2 minutes to ask him a few questions, I tried to ask him a few things about Google vs Apple. MG Siegler is probably one of the top most influential Apple fanboys on the web. 8. Windows Phone 7.5 interview, an overview of some of the latest Windows Phone devices and some of the latest news in Windows Phone land. 9. Test driving the Renault Twizy, this is a cool new 7000€ compact electric car. 10. Bill Gross interview, founder and CEO of http://idealab.com he invests in many startups and web companies, here's his opinion on Google+, Facebook, Twitter and more. 1. Pixel Qi launches 10.1″ super thin 1280×800 screen, their first showing of the 1280x800 resolution Pixel Qi screen to be mass manufactured in Q4, they also will mass produce 7" in Q3, and listen to this video for more talk by Mary Lou Jepsen on the latest status and news on Pixel Qi in the industry. 2. Latest e-ink e-reader news from Freescale, check out the new Android friendly i.MX508 that may be used in the new Nook and Kobo to also use Android as software basis for e-ink e-reader innovation. This video is also featuring the new Acoustic Pulse Recognition (APR) touch screen technology integrated in a prototype e-reader by Tyco Electronics. 3. ShiZhu Technology shows Pixel Qi Tablets, ShiZhu Technology is a big Chinese manufacturer, they can now mass produce Android Tablets with Pixel Qi screens. This video features comparisons of its matte Pixel Qi screen compared with the glossy Archos 70 Internet Tablet screen and with HTC flyer with a matte anti-reflective layer. 4. MHL now in several phones at Computex 2011, the MHL protocol for sending HDMI over Micro-USB is now not only on the best ever smartphone the Samsung Galaxy S2, it's also now in HTC Sensation, HTC Flyer, Evo 4G and Evo 3D phones and more to come. 5. The whole ARM Powered Tablet or Laptop with Pixel Qi screen can run on a relatively small and cheap $3 1W solar panel, Solar panels could be built-in to the bezel, on the back of tablets or laptops or on a flip-out screen protector to thus be able to power the whole tablet and laptop and charge its battery just from direct or indirect sunlight. This means children in Africa, India, other places with a lot of Sun but little power, could be getting Internet connected ARM Powered devices that can run just on sun power. Pixel Qi is able to demonstrate that this works, but they didn't have the time to set it up at Computex and the day I was there to film it was half-cloudy in Taipei (it had been raining some of the days during Computex) so perhaps not optimal for filming the actual demonstration. Pixel Qi could be releasing an official video showing pretty soon on their blog proving that this works today. 6. Texas Instruments talks Memory Bandwidth and Desktop Computing performance on the OMAP4430, TI suggests that they may have the fastest memory bandwidth on their OMAP4430, OMAP4460 and on the newly announced OMAP4470 that goes to 1.8Ghz. 7. Cupp Computing turns every Laptop into an ARM Powered laptop with hard drive to SSD replacement module, this is really awesome, it means that all Intel/AMD x86 powered laptops can easily get added an ARM Processor to their motherboards, or added in replacement of the Hard Drive with an SSD, to provide every laptop with the option to run up to 40 hours on a battery on a button switch. Imagine if by a button switch you could automatically resume your x86 work in the ARM version of Windows, thus extending your battery runtime by 10x or more. This could be a great transitional solution from x86 to ARM for people not yet totally confortable with going away from x86. 8. HD Video Conferencing on Texas Instruments OMAP4430, 720p and 1080p SIP and Skype video conferencing is now possible on the modern ARM Powered smartphones and tablets, just amazing. 9. Hands-on with Nvidia Kal-El Quad-core ARM Cortex-A9 1.2Ghz (or more) prototype tablet, Nvidia continues their run towards bringing Quad-core ARM Cortex-A9 to the market, to be clocked at least with 1.2Ghz maybe more, it may reach the commercial top brand name Honeycomb tablets after August, normally well in time before Christmas. Nvidia has upgraded their graphics and video playback support significantly. 10. ZiiLabs ZMS-20 Dual-core ARM Cortex-A9, with ZiiLab's Stemcell alternative to DSP/GPU for massive multi-threaded computing it seems to run Honeycomb smoothly on their Jaguar 10.1" and 7" reference design tablets. 11. Nufront Cortex-A9 (up to) 2Ghz runs Ubuntu 11.4 ARM Edition, they show that they have completed their tablet reference design, now just gearing up for commercial announcements for products using their new powerful chip. 12. Qualcomm says their Dual-core strength is in being asynchronous, Qualcomm's implementation of the ARM Dual-core is about to reach many of the top most powerful ARM Powered devices. With the HTC Senstation coming out now, Asus Memo coming out later and many other smartphones and tablets in preparation. 13. ZTE Light tablet featuring their 7" Pixel Qi screen (not yet matte, still glossy on that prototype). 14. Asus Memo, worlds first 7″ Honeycomb, Honeycomb looks great on 7", even with it only being optimized for larger 1280x800 screens for now. Maybe it is too bad that Asus only wants to sell this with a 3D screen and this expensive looking Bluetooth headset/remote control MiMic thing. I also filmed another 7" Honeycomb tablet, the Viewsonic 7x using Tegra2. 15. Samsung Origen, the new $199 Exynos 4210 development board, possibly the most powerful publicly released ARM Powered development board, to be sold for $199, featuring Samsung's latest Dual-core ARM Cortex-A9 processor with Mali-400 graphics, fast DDR3 RAM and other features of fast memory bandwidth. 16. ARM President Tudor Brown Computex 2011 keynote, 15 minutes of his Computex 2011 keynote talking about how ARM is dominating the world. 17. ARM keynote at Computex 2011, Ian Drew is the Executive VP of Marketing at ARM, here's my recording of most of his keynote speech. Sorry for missing out the first 3 minutes in this video, and my audio volume is a bit low you have to turn up your playback volume to the maximum to hear things clearly enough.Q Which was fun to come right after the Intel keynote. A notable quote from this keynote is this part: "Multiple options is always better than one size fits all". 18. Qualcomm Dragonboard, $300-$500 Dual-core MSM8660/APQ8060 development board to work on Qualcomm's Dual-core platform. 19. VIA WonderMedia Prizm WM8710 ARM11 Gingerbread solution, now VIA also has a newer faster DSP-accelerated Gingerbread solution for low-cost Android tablets. 20. ARM Powered Android to lower cost and power consumption of Point-of-sale setups, POSLab shows in this video how they are implementing ARM Powered solutions runing POS software on top of Android to significantly lower the cost and power consumption of Point-of-sale systems to be used by all stores around the world. Following is my summary and my top-20 videos filmed during 10 days spent in Shenzhen and Hong Kong, at 3 tradeshows, filming, interviewing, uploading and posting 97 videos from the Shenzhen Electronics Fair (April 8-10th), China Sourcing Fair (April 12-15th) and HKTDC Electronics Fair (April 13-16th). With all those many videos posted, it can be hard for you to look through all of them to find out which are the best. That is why I now always summarise my best videos in a post in the Top Video Lists category. Many awesome new ARM Cortex-A9 tablets and cheap smartphones were shown. - AmLogic, I filmed 9 new videos: , , , , , , , ,  (in order of most to least interesting), it's a new low-cost Single-Core Cortex-A9 processor, clocked at 800Mhz for now, it can be found in the first sub-$100 Cortex-A9 tablets (resistive). The performance of these are likely better than 1Ghz Cortex-A8, but I will test this on my Kinstone AmLogic tablet sample (that I bought for $130 (850 renminbi)) and report in my upcoming second part video-review soon. - Mediatek, I filmed 10 new videos: , , , , , , , , ,  (in order of most to least interesting), this low-cost ARM9 processor seems to win big in the Chinese made emerging Android smartphones market. It's absolutely amazing how cheap some of the Mediatek MTK6516 based Smartphones are being sold at, I bought a $87 FG8 Mediatek MTK6516 based Android Smartphone (that looks similar to a HTC Desire with its casing design). With Mediatek's upgraded ARM11 3G-enabled MTK6573 Smartphone processor coming up, they may again make big wins in the Chinese smartphone market and bring sub-$100 maybe soon sub-$50 Android smartphones to the worldwide (not only emerging) mass market. Amazing. - NEC/Renesas, I filmed 7 new videos: , , , , , ,  (in order of most to least interesting), about 2 years ago, NEC Electronics and Renesas merged and out of that merger is coming this new NEC/Renesas EV2 ARM Cortex-A9 Dual-Core 533Mhz processor, the SoCs based on it are very low priced. Consider this to be the Japanese ARM Cortex-A9 Dual-Core entrant. Some of my reports claim that a nice capacitive tablet design based on this processor can be sold in bulk for as little as $110, $125 or $135. I bought a sample from Livall.cn for $171 which I will soon video-review further. 1. Archos 7c Home Tablet, RK2918 Capacitive, Archos are building amazing value tablets based on the Rockchip RK2918 ARM Cortex-A8 1.2Ghz processor, with great capacitive touch screens, and they are bringing that to the definitely sub-$200 price range. As I am probably the biggest Archos fanboy in the world (I'm the admin and founder of http://forum.archosfans.com), I found it super fascinating to meet their expert staff and visit their Shenzhen headquarters. 2. Arnova 10 capacitive RK2918 to be released in May, at possibly $229 MSRP, for this 10.1" capacitive Rockchip RK2918 ARM Cortex-A8 1.2Ghz tablet, it's hard to find better value 10" tablet. Consider this kind of price is for a product that will be massively available at all retail stores in Europe and the USA, that price is the retail price, including all import taxes, fees, margins and everything. I believe Archos can make huge sales of their new Arnova line, especially now that they are able to bring ARM Cortex-A8 performance and nice capacitive screens to these entry-level priced devices. 3. Best of Shenzhen: $87 Android 3.5″ capacitive phone, MTK6516 FG8, that is my initial video review of my new FG8 $87 Android Smartphone. Mediatek MTK6516 based, with Android 2.2 Froyo and a 3.5" HVGA Capacitive touch screen. This is amazing to see how cheap the Android smartphones are getting. Check back for my further video reviews coming up to show the performance and features of this cheap smartphone platform. 4. Shenzhen Behind the Scenes 1: Hongda Factory tour, a fascinating look inside of a small Shenzhen consumer electronics factory. That day they are manufacturing Intel Atom based netbooks, the day before they were making cheap Freescale i.MX51 based tablets for utopiacn. 5. Geniatech explains their AmLogic Cortex-A9 Single Core Set-top-box, an interview with the product manager on this sub-$100 AmLogic based set-top-box, watch this to get an idea how the potential upcoming Google TV on ARM based set-top-box makers are planning their global sub-$100 ARM Powered Set-top-box market entry. 6. $95 Cortex-A9 Tablet Review, Kinstone KS-UMD070A9, my initial review of this sub-$100 (bulk, resistive) ARM Cortex-A9 AmLogic 800Mhz Single Core tablet. I've got the review sample right here, so I will post a further full video review with benchmarks, video codec tests and other speed tests as soon as I get the time, check back for that. 7. Shenzhen Behind the Scenes 3: Richtechie.com, Freescale i.MX51/53 PCB designer, have a look behind the scenes at a PCB designer in Shenzhen. This PCB design house makes Freescale i.MX51 motherboards and they are working on their upcoming i.MX53 based PCB designs. They work with utopiacn. 8. Archos at the Shenzhen Electronics Fair, not much news in this video, it's just interesting to see how Archos has a big booth at the Shenzhen Electronics Fair and uses it to do sales of their devices towards growing their sales in the Chinese mainland market. 9. Catwalk girls show Tablets and Smartphones in Shenzhen, just fun if you would like to see how the Tablets and Smartphones are the center of the trendy topic at the Shenzhen Electronics Fair. 10. NEC/Renesas EV2 ARM Cortex-A9 Dual-Core 533Mhz in videos with Livall.cn, Gaia, Ebot, Quality Industrial and TAL Electronics. 11. Rockchip Rk2918 in a Set-top-box, this could power a sub-$50 ARM Powered Google TV Set-top-box. 12. Honeycomb at the Rockchip booth (just keyrings for now..), once you get Honeycomb on the Rockchip RK2918 (could be happening by Google I/O on May 10-11th? ), that could create the most explosive disruptive mix for the tablet industry. Also check-out my video of the Rockchip RK2918 based laptop which could also provide great value for an ARM Powered laptop running Chrome OS or Honeycomb. 13. Review: $120 Hero H2000 MTK6516 Android Froyo Powered iphone4-copy, my initial video review of my new $120 iphone4-clone that seems to run Android 2.2 super smoothly on this 3.5" HVGA capacitive touch screen Mediatek MTK6516 based Hero H2000 smartphone. It's probably manufactured by Karasnn.com. 14. Epudo Telechips Cortex-A8 tablets, the new Telechips 8803 ARM Cortex-A8 1.2Ghz processor may be reaching stability for Android Gingerbread support. Telechips 8803 ARM Cortex-A8 1.2Ghz Gingerbread also featured in videos with Digilink and huashiguang. 15. MID123.com Hummingbird Gingerbread Tablet, Gingerbread seems also to be reaching stability on the Samsung ARM Cortex-A8 Hummingbird processor platform. 16. Karasnn.com Hero Android MTK6516 Smartphones, interview with one of the potentially leading Mediatek MTK6516 based Android smartphone makers. 17. Meizu M9, $380 Android phone with Retina Display, interesting to see a 3.5" Retina Display and the Samsung Hummingbird ARM Cortex-A8 1Ghz processor in this new Meizu M9 phone. At $380 unlocked it's expensive, but surely less expensive than an iPhone while having pretty similar hardware performance. Meizu has several stores in the Shenzhen electronics market area, they seem to be a relatively big smartphone brand in China. 18. Trend Technology (HK) Ltd does Android Tablets, discussion with an insider how to get those tablets made and distributed. 19. Performance test on AmLogic ARM Cortex-A9 Android Set-top-box, testing the performance doing web browsing and more on this AmLogic development board. It seems fast! 20. Ramos booth tour, featuring Ramos W18, 9.7″ capacitive ARM Cortex-A9 AmLogic Android Tablet, Ramos has nice new products. Also check my videos of the Ramos T8Pro and Ramos V70/T11Pro/T11AD. 1. Worlds first Samsung Exynos 4210 ARM Cortex-A9 tablet presented by Hard Kernel, it's just awesome to see this $750 dev-kit transparent Tablet design, allowing to see through all the awesome hardware features of this platform. 2. Worlds most compact Tegra2 PC presented by Toradex, the potential is a $150 ARM Cortex-A9 Powered desktop PC, with dual-screen output (one HDMI, one VGA), USB host ports, Ethernet, audio input/outputs and more. It's cool! 3. $200 Tegra2 slim PC by Trim Slice Compulab, yet another cool looking Tegra2 powered super compact desktop PC, this one may actually seem to be more finalized than the Toradex, in terms of software and in terms of cheap motherboard design availability, though it's to be seen once it gets released what the status for software and hardware pricing will be then. 4. 4K2K video playback on the new Texas Instruments DaVinci DM816x and DM814x, the powers of Texas Instruments DaVinci ties in with what they do with OMAP, the DaVinci perhaps targetting more video-centric uses such as potentially one of the next $100 ARM Powered Google TV set-top-boxes. 4K2K ARM Powered Google TV at $100 retail would be awesome. Until then, the OMAP4 stuff is not yet in these DaVinci and the video stuff is not yet in OMAP4, but those are merging their powers. 5. Seco shows x86-ARM Cross Platform, they work on making it easy for the industry to get away from using x86 and to use ARM solutions instead. They support OMAP4, Tegra2, OMAP3 and i.MX51 designs among others. It becomes as easy as swapping the one for the other, all other aspects of the design, even the software being interoperable. 6. QNX talks about their software on the Blackberry Playbook, still no confirmation if Blackberry will choose to install a Dalvik Engine on top of this to support Android apps in there, but it's sure interesting to try to understand how QNX does it to utilize the dual-core ARM Cortex-A9 Texas Instruments OMAP4430 processor to its fullest to provide the smoothest UI and multi-tasking.